At some point I acquired an ornamental orange tree. It was probably 20 or more years ago, and each year I put it outside for the summer and brought it in October, where it might--or might not--bear one tiny orange. 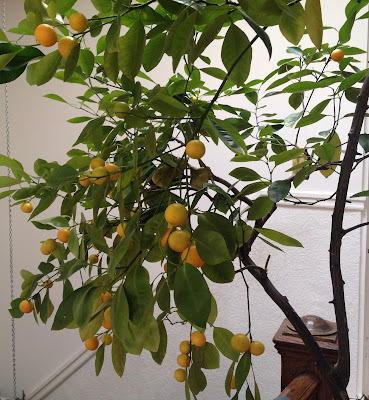 This year I must have done something right, because it had a lot of blossoms when I brought it in, which have transformed into perhaps three dozen oranges. Quite wonderful, I think. Later on when they start to fall, I'll get the grandkids to plant some of their seeds so they can have their own little tree. I found the method particularly interesting because I'm currently struggling to organize the vast amount of material I've been collecting about concrete for my next book Rock of Ages: How Concrete Built the World as We Know It. Right now I'm wondering: Why not use the four elements the Ancients recognized--earth, fire, water and air--to tell this story?